As a brand with more than 125 years of rich history, ChapStick enlisted the help of Coyne to shift consumer perception of the brand from a therapeutic drugstore product to a premium beauty brand providing skincare for lips. Through fashion and beauty sponsorships, media and consumer activations, and targeted influencer engagement to launch its latest innovations, ChapStick is now looked upon not only within the industry, but also by consumers, as a beauty brand. ChapStick® challenged Coyne PR to create brand awareness outside of the cough and cold aisle by changing perceptions to get consumers identifying ChapStick® as a beauty brand. With two new products launching – Coyne PR was charged with generating media coverage around the new launches that would position them as beauty products and ultimately help transform the way the brand is perceived, all while continuing to reinforce ChapStick® as the expert in lip health and lip care. 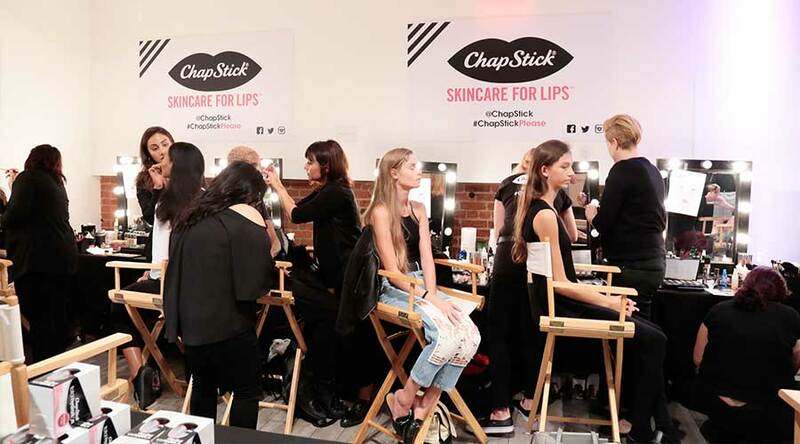 As the Official Cosmetic Sponsor at Style360 New York Fashion Week, ChapStick's Total Hydration line was widely promoted from a consumer activation to backstage usage and ChapStick branding on the shows’ runways during the nine-show lineup over three days. ChapStick turned to Coyne PR to leverage its partnership with Alex Morgan, Olympic gold medalist and member of the U.S. Women’s National Soccer Team. Coyne celebrated the launch of the latest ChapStick® product line, ChapStick® DUO, at the brand’s first-ever storefront media event. In attendance were contacts representing 26 top media outlets including InStyle, BuzzFeed, SELF, Refinery29, Seventeen and Allure. Media were invited to attend as a “duo,” a.k.a. with a friend, which included a playful and relaxing painting activity. Hydration 100% Natural, Coyne shared a first-ever behind-the-scenes look at the innovation process at the ChapStick® Lip Lab in Richmond, VA.
To further align with the beauty and skincare space, ChapStick®, America’s favorite lip balm brand launched a first-ever tinted product and challenged Coyne PR with generating media coverage for this milestone innovation. Coyne PR was handed the microphone to promote ChapStick® Sessions – a music-focused initiative punctuated with a concert promoting up-and-coming talent, including Emeli Sandé and Skylar Grey, and limited-edition Cupcake Creations flavors, whose launch timing was immediately following the ChapStick® Sessions concert.